Update, March 23: The System Shock remake is still happening, according to Nightdive Studios. Last month, Nightdive Studios announced that development of their System Shock remake was going on hiatus, after the scope of the project ballooned far beyond the original pitch or what the team were capable of. That doesn’t mean that the game won’t come out, of course, just that it will be scaling back on its more ambitious points as the developers reassess their direction. You may want to check out some of the other best old games on PC while you wait. Kick says the decision to rethink was based in large part on backer feedback that “we weren’t going in the right direction with the game, what we promised to them.” The remake went from a largely faithful recreation of the original in a new engine to a redesigned reboot full of new features. The remake, in slightly reduced form, will still be built utilizing Unreal Engine, though it will be closer in form to the original Unity demo. Kuperman also says they’ve had more interest from publishers since reducing the scope, so hopefully they’ll have the financial support necessary to ensure the project comes to completion. 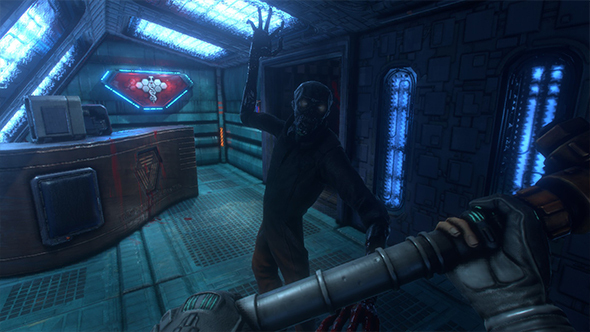 Original story, February 16: Nearly two years ago, Nightdive Studios raised over $1.3 million on Kickstarter to fund a remaster of the original System Shock. Thanks to the campaign’s success and publisher interest, the scope of the game expanded into a full remake – but now, it seems the project’s gotten far too big. Last year, Nightdive revealed that they would apply “modern level design principles” to the remake at the same time as they announced an engine switch from Unity to Unreal. Before the Kickstarter, they had already released System Shock: Enhanced Edition, a version of the original lightly updated to run on modern PCs. System Shock 3 is still in development at Otherside Entertainment.